Back in January, when Gordon Brown gave his first major speech on health to kick start the political new year, one area which will have raised a wry smile among OH professionals was his statement that the NHS will provide more screening to enable earlier detection and prevention of illness. Familiar territory for us in OH, so positive news me thinks. Among Brown’s several promises was a provision of screening for vulnerability to heart and circulation issues, and a statement that his cronie health secretary Alan Johnson will bring forward proposals to enhance the role of employers in helping their staff lead healthy lives. Now, steady on Gordon this looks like you may have finally recognised the workplace setting as a place for managing health. 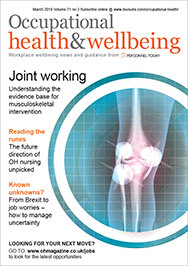 Further evidence of the government’s desire to encourage UK plc to take control of employees’ lives is the anticipated launch by the National Institute for Clinical Excellent (Nice) of workplace health promotion objectives – due to be published in May – with the aim of encouraging employees to be physically active. At last it’s great to see some joined-up thinking. If the Nice objectives are to see the light of day and be effective in reducing the number of working days lost through absence from 164 million in 2006, then employers, HR professionals, trade unions, OH professionals and employees will need to work in partnership to improve the nation’s health and wellbeing. The issue of men’s health should be one which concerns us all. The Department for Work and Pensions has recognised that work is good for you, so maintaining one’s health while getting paid for it seems to make good business sense to me. Good for the employer, good for the employee, and good for the economy. Middle-aged men will be at the heart of the new health screening programme announced by Gordon Brown in January, targeting those who are vulnerable to conditions such as coronary heart disease, strokes and diabetes. Those who are physically active are less likely to suffer from any of these major health problems. Specifically, there will be greater need to focus on obesity, as current trends show nearly 60% of the UK population will be obese by 2050, so there is a need to encourage staff to take more care of themselves in the workplace. This is ever more apparent when we consider that only 25% of organisations surveyed by the Chartered Institute of Personnel and Development in 2006 have a strategy to help improve the physical health of their workforce. The potential of the workplace as a place for improving the health of men must not be understated, as there is good evidence that even though they are reluctant to use mainstream health services, especially primary care – a factor which needs to be acknowledged by the government – men do access services provided at work, and take part in health improvement initiatives (for example, weight management). In support of the government’s health policy targets, this year’s Men’s Health Week (9-15 June) will concentrate efforts and help link this to the government’s Health, Work and Wellbeing strategy. Brown’s statement also alludes to the notion of the nation managing their own conditions, with encouragement to take advantage of the support offered by GPs and nurses in the home or high street, and one assumes from my namesake Alan’s objective, to also consider what the workplace has to offer. As the working population gets older, with estimates by the NHS that in 2006, 20 million people were aged 50-plus and that by 2026, 50% of the adult population will be over the age of 50, we need to be mindful of this demographic change and plan for the health needs of the working population. Given the planned screening for abdominal aortic aneurysm by GPs, we may find that as our working population grows older, we will work in partnership with primary care trusts in support of GPs by screening the ageing workforce in the workplace – so called care in the ‘working’ community. So as the relevance of the working nation’s health gathers momentum, and we get used to the reality that many of our clients may still be working well into their 60s, it is gratifying to note that our nation’s leaders do appear to be forward planning for a healthy working future.